JSU | Criminal Justice | Richard R.E. 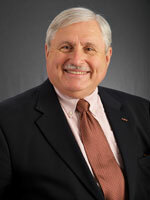 Kania, Ph.D.
Richard Kania joined Jacksonville State University in December 2005. Previously, from 1982 to 1999, he was at Guilford College in Greensboro, NC, where he rose to full professor and department head. He taught at the University of North Carolina-Charlotte; for the Southern Police Institute of the University of Louisville, and as a Senior Fulbright Professor for the Central European University while on sabbaticals in Warsaw, Poland. In 2004-2005, he was awarded his second Senior Fulbright Professorship teaching at the Belarusian State University in Minsk, the Republic of Belarus. Dr. Kania originally majored in anthropology at Florida State University, where he earned his BA with Honors in 1968. He continued in anthropology at the University of Virginia, earning his MA there in 1974, and wrote his MA thesis on conflict resolution and the law ways of the Hopi of Arizona. Between his BA and MA degrees, he served in the Army in Berlin and in Vietnam. He also was a city police officer, and that experience led him to change his major midway into his doctoral studies, and to re-direct him into a teaching career in criminal justice. He is extensively published with articles in over 20 journals. He has authored two books, co-edited another, and has edited one journal special issue, and several major government and research reports. He is the recipient of numerous awards and grants, and has held offices in professional and public service organizations.